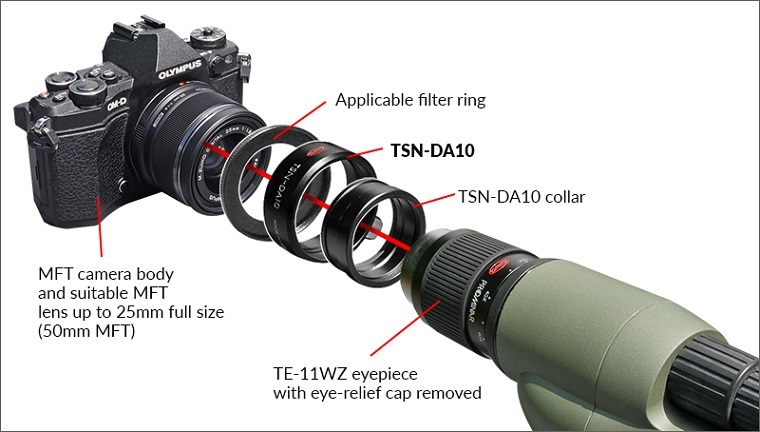 The Kowa TSN-DA10 digiscoping adapter is no newbie in the digiscoping world – Kowa has always been at the forefront of digiscoping and the DA10 was a popular choice for digiscopers using compact cameras with fixed internal lenses when digiscoping was still in its infancy. We all remember the popular models? Nikon Coolpix 4500 and the classic Contax U4R. Whilst these camera models may have faded away as camera technology moves forward at a rapid rate, digiscoping has gained ever more popularity with results often super-seeding high end DSLR and lens combination performance. No other system offers telephoto focal lengths as great as digiscoping. 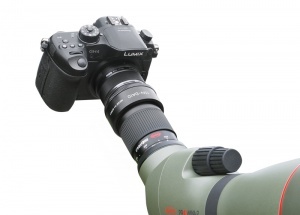 With the latest Micro Four Thirds camera technology and an ever increasing demand for a lighter more compact digiscoping system – it’s time for the Kowa TSN-DA10 to shine again. The Kowa TSN-DA10 is perfectly suited to the compact and lightweight Micro Four Thirds camera system bodies and Micro Four Third compact lenses up to 25mm focal length (full size) (50mm MFT equivalent). Use with our flagship 880/770 series spotting scopes combined with a Kowa TE-11WZ or TE-10Z eyepiece. 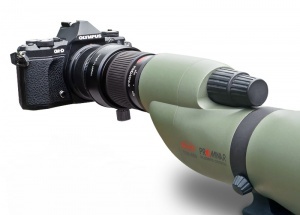 Kowa believe digiscoping should be easy and affordable – The TSN-DA10 ticks both boxes. Set-up takes less than a minute. Simply unscrew the eyepiece eye-relief cap and screw on the DA10 collar in its place. Screw the DA10 adapter to your MFT lens filter thread. 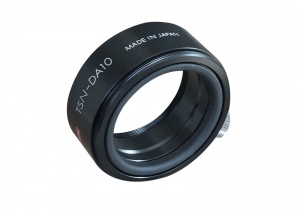 The DA10 fits lenses with a 43mm filter thread. If your lens has a different size filter, simply add one of our adapter rings - AR28/30/30.5/37/43/46/52/55/58/62/72mm between your lens and the DA10. Finally push the connected DA10 and camera body combination over the collar and secure. Performance and ease of use of this system is exceptional. Using a wide aperture fast MFT lens delivers blisteringly fast shutter speeds with low ISO settings, combined with a Kowa fluorite crystal spotting scope – image quality is breath-taking with virtually no chromatic aberration (colour blur) and delivering stunning levels of detail. 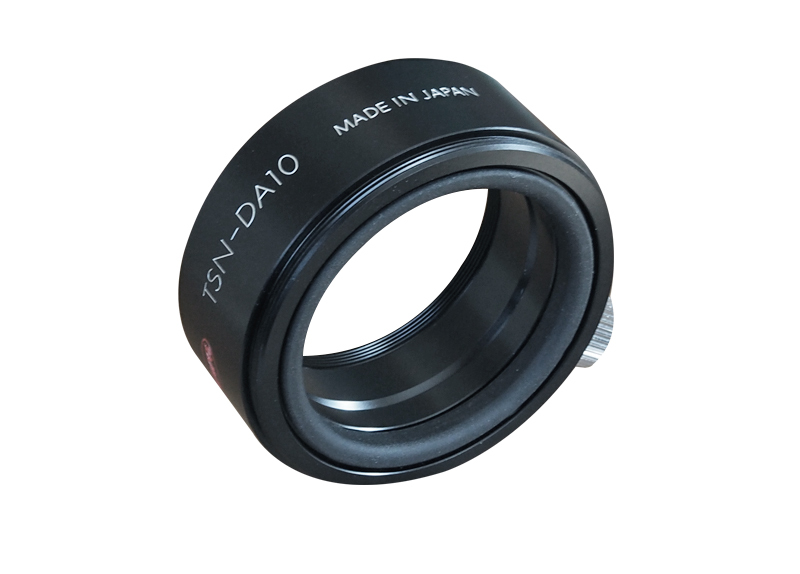 CAUTION: The Kowa TSN-DA10 System works with all camera sensor body sizes but larger systems may exert too much stress on your lens filter thread. Kowa accepts no responsibility or liability for any damage you may cause to your equipment when using our adapters.